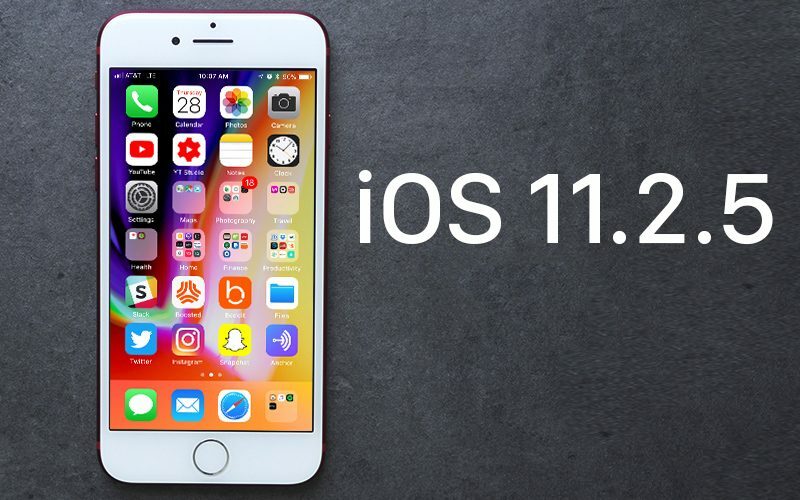 Apple today released iOS 11.2.5, the tenth official update to the iOS 11 operating system that first came out in September of 2017. iOS 11.2.5 comes two weeks after the release of iOS 11.2.2, an update that introduced Safari mitigations for the "Spectre" vulnerability impacting Apple's iOS devices. The iOS 11.2.5 update can be downloaded for free on all eligible devices over-the-air in the Settings app. To access the update, go to Settings --> General --> Software Update. According to Apple's release notes, the iOS 11.2.5 update introduces support for the HomePod, which will be released on Friday, February 9, and it brings fixes for several bugs in CarPlay, Messages, and Mail. The update also includes audio-based podcast news delivered via Siri, which was also officially unveiled in iOS 11.2.2 last week. With the podcast news feature, you can ask Siri to play generic news sourced from NPR, Fox News, The Washington Post, or CNN, but you can also ask for news specific to topics like Sports, Music, and Business. In Control Center, the iOS 11.2.5 update brings a new layout for audio controls. When accessing the music widget on an iPhone or iPad, when you 3D Touch or press on the icon in the upper right hand side, all available audio playback sources are now listed as separate tiles. Tapping on one of the audio sources, such as an Apple TV, allows audio to be played on the device and controlled separately from the iPhone. Using this feature, you can listen to music on one device, like the Apple TV, without interfering with audio playing on the iPhone. iOS 11.2.5 appears to address a bug that allowed a malicious link to freeze the Messages app on iOS devices. As of the sixth beta, the link in question no longer affects the Messages app. Apple is supposed to be releasing an iCloud Messages feature that was pulled ahead of the iOS 11 release, and which many people are eagerly awaiting, but there is no sign of the feature in iOS 11.2.5. Apple has also promised that new, more extensive details about battery life will be coming in early 2018, but those new tools are also missing from iOS 11.2.5, so we may instead see them in the next iOS update. Those weren't really expected with this release. You’re right. They were expected last year with iOS 11. What ever happened to 11.2.3 or 11.2.4? What? You missed these versions? They were, without doubt, the most spectacular releases EVER! There's a chance that the out-of-order messages bug is related to tests of iCloud Messages. It could be that they're testing iCloud Messages for a subset of users. For these users, they could be pushing messages to the cloud for each individual device, and then reading them back from the cloud (but still not syncing the messages across devices). If there was a bug in that logic, we would expect it to affect both iOS and macOS. The bug only affected some users on some devices. For me, it affected my iPad, but not either of my macs nor my iPhone. A friend of mine had it on his iPhone, but no other device. Another friend only had it on his Mac. So it could be that one of each of our devices was in the test group. * • Setup and automatically transfer your Apple ID, Apple Music, Siri and Wi-Fi settings to HomePod. * • Siri can now read the news, just ask, "Hey Siri, play the news". You can also ask for specific news categories including Sports, Business or Music. Yes! Totally going to update from 10.3.3!!! I'm really glad they fixed the out-of-order messages. That has been incredibly annoying to deal with. I saw a performance hit based on Geekbench 4 on my iPad Air 2. It was weird that the multi core dropped so significantly; like it is only using 2 of the 3 cores. I have not installed on my iPhone 8 plus to see the impact. Might not get the best results running something like this shortly after an update. I'd probably try it in a few days to see what it's like then. Meanwhile in Android land, those consumers will be waiting another 6 months to get an update through their carrier.